IsaDora Peel Off Base - Polish This! I got IsaDora Peel Off Base for review a while ago and I've been trying it out thoroughly with several manicures and different polishes. I've used Essence's Peel Off Base Coat before this IsaDora one, but somehow I just couldn't make that one work for me, so I was little bit doubtful on how this might work. I've also tried to make my own peel off base coat by mixing glue and water, but that didn't turn out too great either (and now I can't even open the bottle anymore as it's glued...). So I really wanted to see how this IsaDora one would work as it would be really helpful especially with glitter polishes. It comes in the same kind of bottle as all IsaDora polishes do and so there's 6ml (0.2 Fl.oz) in the bottle. Quite little if you ask me! But I do love that IsaDora Wide Brush, it makes the applying really easy. This has that water based formula and it smells like glue, not too bad, but you can still smell it. It's also quite thick, thicker than some regular base coats. Here I have just applied the base, one coat for each nail except my index finger where I have two coats. It says in the instructions in the bottle that you should use one coat, but I also saw some other instructions where it said that you should use two coats. So here I was trying out which would work better. You should let the base dry out completely before applying any nail polish, I'd say 5 minutes would do the trick. It's really easy to see when it's dry as it becomes transparent. It took only couple of minutes for this to dry on those nails where I had only one coat of the base. My index nails took much longer with those two coats. I was really interested in how easy it would be to remove this as that is where I have had problems before with these peel of bases. They all say you can remove the polish really easily in one sheet, but I've always ended up with just tiny bits coming off. This wasn't the case with this IsaDora one, the nail polish really comes off in one or two big pieces! And it comes off really easily too, you just take one edge and start working from there. So all of them came off really easily and it didn't matter which type of polish you had. The more coats you had and the thicker the polish layer is, the more easily it comes off too. Of course this makes you worried about how the your manicure will last, right? Well, I didn't have too many issues with this either. I noticed that if you use two coats of that Peel Off Base, then your manicure might chip easily or even come fully off, but if you use only one coat, that shouldn't happen. For example, I wore that gradient manicure with those flower decals for five days and washed my hands regularly, showered, did some cleaning and so on and it stayed on really nicely. Basically, I love this! 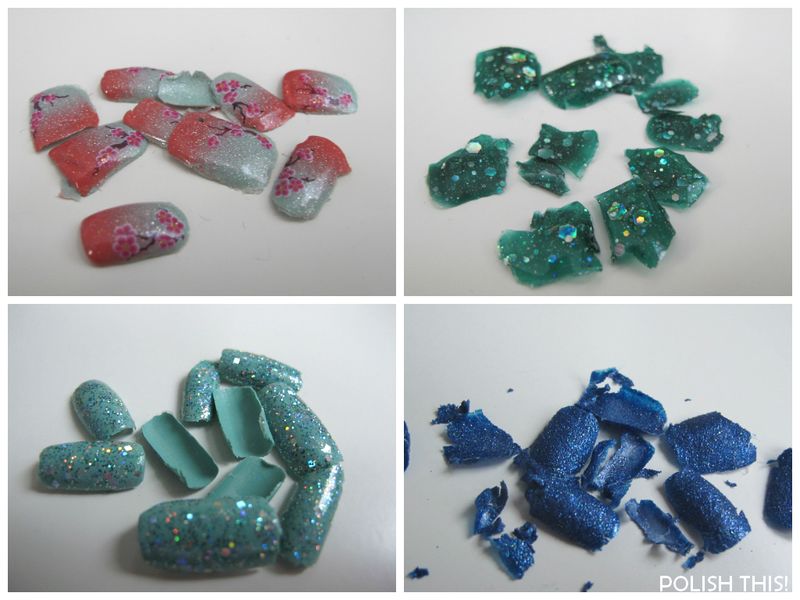 It's really making me want to wear some glitter bomb polishes more often as I know that the removal wont be so hard. The only thing I don't like about this is the fact that it's one of those limited edition type of things, so it's going to be available only short time, at least for now. I'm really hoping IsaDora will make this a part of their permanent selection, but if see this, you should really grab it while you can! *I have gotten this product for review. For more information see my disclosure policy. Tänään siis testissä IsaDoran Peel Off Base, jonka sain jo vähän aikaa sitten arvioitavaksi. Tykkäsin tästä ihan hirmuisesti ja tämä todellakin toimi ainakin minulla! Tätä Peel Off Basea kannattaa lakata kynsille ainoastaan yksi kerros ja antaa tämän kerroksen kuivua ennen varsinaisten lakkojen lakkaamista kunnolla. Näin ainakin minulla lakkaukset kestivät hyvinä useita päiviä, eivätkä ne alkaneet mitenkään halkeilemaan tai irtoamaan. *Peel Off Base on saatu arvioitavaksi maahantuojalta, Pretty.fin likki on tässä vain vinkkinä, en hyödy sen käytöstä mitenkään. I find this peeling off a very interesting thing... and for me it works without any of these base coats or glue! I use a very thin coat of lanolin and most of the times everything comes off. Sometimes I use this hair oil (silicone) and some gel/liquid nail care stuff. It started with more protection for my super soft nails...and it works! Before your report I only heard of this kind of base coat not working... good to know some do work! I think there is a lot of things you can do for "tricks" and you don't hear a lot, because people want to sell product. Everything is english and german. This is really good! :) Yeah, I don't know how the Essence one should be used as I don't seem to get it work right ever. You're language is just fine! :) Does the Essence work for you? I haven't gotten it to work as it should.